Ukrainian-American Concordia University (formerly WIUU) has launched and is successfully developing dual diploma programs with the state University of Minnesota Crookston (the USA), Concordia University – Wisconsin /Ann Arbor (the USA), state University of Koblenz-Landau (Germany), and the University of Occupational Safety Management in Katowice (Poland). Each of the programs offers students an opportunity to study in the international environment and acquire the relevant knowledge and skills in both partner universities – Ukrainian-American Concordia University (ConcordiaUA) and one of our foreign partner institutions. If you are already enrolled in ConcordiaUA or are planning to become our student, you can consider the option of combining studies at ConcordiaUA with pursuing a bachelor’s / master’s degree in the USA, Germany or Poland. Just make the right choice! The offer is also available for ConcordiaUA alumni. Dual Master Degree with the University of Occupational Safety Management (Poland) – МВА, International Management, Project Management and Psychology in International Business. Our students and would-be students are offered the opportunity to earn their bachelor’s degrees within our new Cooperative Bachelor Degree Program, launched jointly with one of the campuses of the state University of Minnesota Crookston (the USA). Cooperative Bachelor Degrees with the University of Minnesota Crookston (the USA) offer a variety of Majors and Minors. In April 2018 Ukrainian-American Concordia University signed Articulation agreement with Concordia University Wisconsin/Ann Arbor (USA). 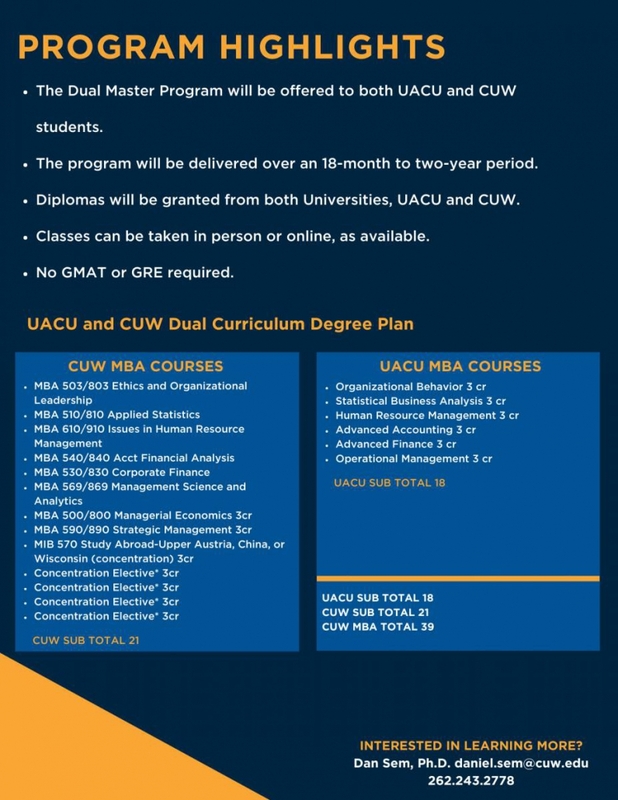 Now our students can get a master’s degree in management of foreign economic activity/MBA of our University and a master degree in business specializations at our partner Concordia University Wisconsin/Ann Arbor (USA). 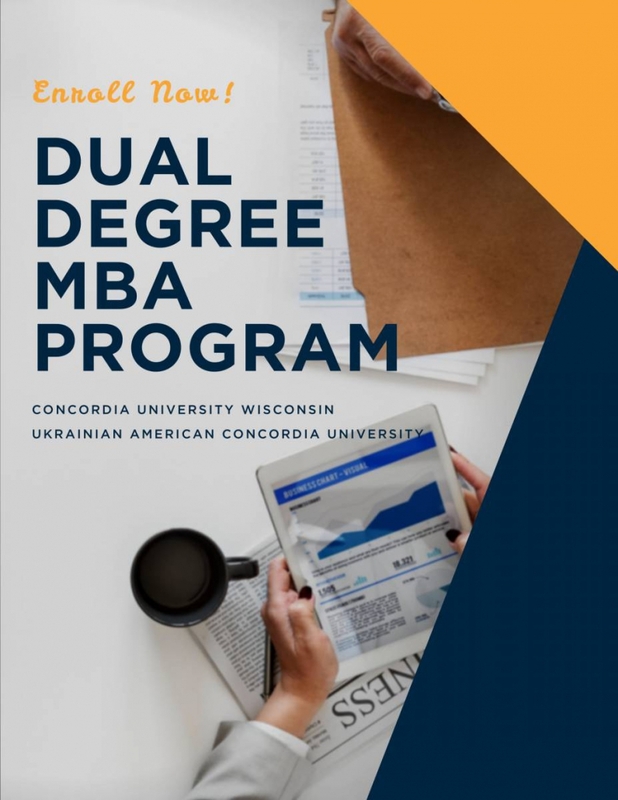 To do this, six subjects from the agreed master’s curriculum will be taken by students at Concordia University Wisconsin/Ann Arbor (USA) – online or at one of the campuses of Wisconsin or Michigan. Our master’s degree pursuers now have the opportunity to sign up for the brand-new Cooperative Master Degree Program developed jointly with the state University of Koblenz-Landau (Germany). The Program offers students a chance to study in an international environment, gain knowledge and skills from both partner universities, based on the common concept of complementary curricula. The students will, for example, study the first phase at WIUU, then they will take part in online modules as part of the general blended learning concept for the major of ETI-M, provided via distance learning from the University of Koblenz-Landau in the second phase. On completion, successful students will potentially achieve two (three) Master Degrees: one (two) issued by WIUU, and one issued by the University of Koblenz-Landau in Germany. The students are guided by their professors and tutors via an online platform (Moodle), and they can get in touch with both during online consultation times, as well as with other students. It might also be the case that the online lectures will be accompanied by on-site lectures at their home university. At the end of this program, students have to write their master thesis, which will normally be supervised by two professors: one from their home university, and one from the University of Koblenz-Landau. Master of Science in Information Management (Major in Entrepreneurship, Technology and Innovation Management) – from the State University of Koblenz-Landau (Germany). 50–70% of the courses are to be taken at ConcordiaUA. To be eligible for Ukrainian State Diploma, all students pursuing a master’s degree within the Program must do a Research Project and a Presentation, defend the Master Thesis and sit the State Examination. 50–30% of the courses are studied at Uni KO-LD. Master Thesis and Colloquium are carried out under joint supervision of Uni KO-LD and WIUU. 2. International MBA Diploma from ComcordiaUA (accredited by FIBAA). 3. Ukrainian state diploma from ConcordiaUA (provided they complete the program according to the national requirements, i.e. successfully sit state examinations). All students taking part in the cooperative master degree program have to officially register at the Uni KO-LD in order to attend the studies as described above and must obtain German health insurance for the entire period of their studies. As state universities don’t charge any tuition fees, students are to pay only basic charges and a reasonably low administration fee applicable. Students signed up for the cooperative program can take a short-term internship in Germany in order to explore and gain deeper insights into the entrepreneurial ecosystem in Koblenz. Groups of at least ten students are liable for this internship, organized by the University of Koblenz-Landau. ConcordiaUA graduates who have already achieved their bachelor’s degrees can earn their master’s with the Cooperative Master Degree Program, offered jointly with the University of Occupational Safety Management (Katowice, Poland). Project Management or Psychology in International Business – from the University of Occupational Safety Management (Poland). POWER (for students enrolled in the Program). Note: A good command of the Polish language is required for internships undertaken in Poland; in case of training in other EU countries, good knowledge of English is a must. In addition to Dual Degree Programs, ConcordiaUA is further developing academic exchange programs with our long-standing partners – Concordia University Wisconsin / Ann Arbor (the USA), East Central University (the USA), Trier University (Germany), the University of Applied Sciences (Germany), RichmondInternational University (the UK) and many others. For twenty years, ConcordiaUA has been creating unlimited opportunities of communication, employment and living in the global international world. ConcordiaUA students pursuing a Dual Degree or participating in an International Exchange Program have full access to the resources of our foreign partner universities, incl. libraries, e-resources and databases, distance learning platforms, etc.